Human DNA is not identical among individuals and this causes natural differences among races and ethnic populations, and also among healthy individuals and individuals susceptible to diseases. While natural differences between humans are harmless and are essential to maintain the diversity of human population, DNA defects leading to high risks of disease are unwanted and need to be discovered, in the best case scenario, even before an individual gets sick. This approach, known as personalized diagnostics, is being extensively developed by many researchers in both academia and industry. Once the cause for a disease is known, a doctor is provided with the information which can be used to prescribe specific, not generic, drugs for the patient which will be the most efficient for their treatment. This approach will have several important outcomes: (a) it will allow patients with a high risk for developing a disease to be diagnosed ahead of time and to be prescribed a preventive treatment; (b) it will allow already sick patients to receive a personalized treatment more suitable for their genetic disorder; and (c) it will improve counseling and parental screening for those who are planning to have children. In the long run, such a development will be at the core of personalized medicine, allowing therapy to be individually tailored to the patient.s own genome. Such research is aligned with the Clemson priority area of health and the roadmap of National Institutes of Health (NIH) as pointed out on NIH webpage .Doctors use a patient.s genetic profile.not just weight or age.to determine the best drug and the optimal dose.. However, the question nowadays is how to distinguish between harmless and disease-causing DNA differences since it is known that missense mutations (deviation of typical human DNA) are responsible for many human diseases or cause the natural differences among individuals by affecting the structure, function, interactions and other properties of expressed macromolecules. In some cases, a single DNA defect causes a major health problem. These diseases are usually rare but serious. Other diseases, such as heart disease and cancer, are genetically complex, with DNA defects from several genes contributing to the disease. The ability of predicting whether a given DNA variation is disease-causing or harmless would be of great importance for the early detection of patients with a high risk of developing a particular disease. Even more important is the ability to offer a specific treatment (personalized medicine) that will reduce or completely eliminate the effects resulting from disease-causing DNA mutations. Our work focuses on further understanding the molecular mechanism of selected monogenic disorders and on developing methodology and in silico tools for fixing malfunctioning protein by binding small molecules onto it. The uniqueness of our approach is that we develop and utilize physics-based methods to predict the effect of DNA mutation on physiological properties of the corresponding macromolecule. In another worlds, once the DNA of a given patient is being sequenced and the patient DNA difference with respect to typical (healthy) DNA is revealed, then we transfer this information on protein level (just to remind ourselves that DNA codes for proteins, thus DNA difference in the coding region of DNA frequently results in difference of the corresponding coded protein). However, to apply physics-based methods, one needs to know what the three-dimensional (3D) structure of the protein is, .i.e what are the positions of all atoms making it. Note that typical macromolecule is made of hundreds of thousand or million atoms. Frequently this information is not available experimentally and we predict the 3D structure by computer modeling. 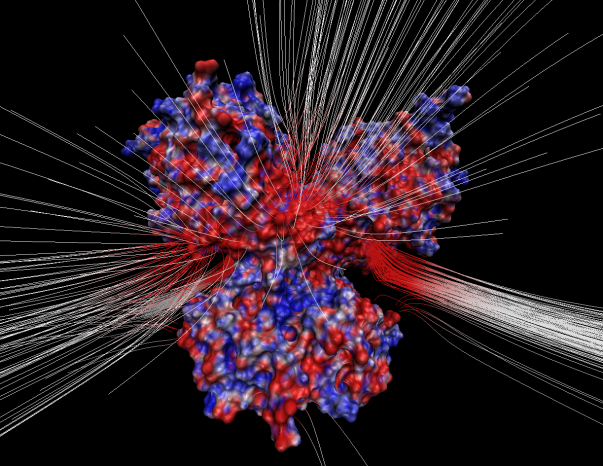 Given the structure of the protein, the DNA difference is mapped onto it and then we carry energy calculations, molecular dynamics simulations and calculations to find the ionization states of ionizable groups. Once there results are obtained, the next crucial step is to associate these physical quantities with the biological function of the protein and to predict if the changes are harmless or disease-causing. Lastly, but very important, we carry in silico virtual screening for small molecules (potential drugs) such so their binding to malfunctioning protein will eliminate or reduce unwanted disease-causing effects. Such an approach is very different from standard clinical or bioinformatics approaches, which are based on comparison against known cases. In lame terms, bioinformatics or clinical approaches make their predictions by matching patient disease symptoms or DNA against set of classifiers as classifiers of disease symptoms or classifiers of DNA variants found to be causing particular disease. While such approaches are very convenient and provide fast outcome, their deficiency is that they do not reveal the molecular mechanism of the disease and cannot predict new cases (cases not observed before). In contrast, the physic-based approaches, in principle, can predict the molecular mechanism of novel diseases and unique DNA differences. The lead scientist in this area in the lab is Mr. Zhe Zhang, whose research revealed that typically the effect of disease-causing mutation does not affect the active site, the place where the corresponding biological reaction occurs, but rather affects the function of the protein indirectly. He showed that a common mechanism is that the mutation either de- or over-stabilize the protein or the corresponding protein ensemble, and thus affecting the function through altered biophysical characteristics. This observation inspired us to seek the possibility that the effect can be mitigated by external stimuli, as for example drugs. Perhaps it should be possible to design small molecules, which will bind to the affected (malfunctioning) protein and restore the original biophysical properties and in result to restore the original function and thus to cure the corresponding disease. Pursuing this idea we established collaboration with the lab of Dr. Maria Miteva at University of Paris, France. She is a leading expert in .virtual screening. of small molecules against target proteins. Preliminary results was already obtained and currently being tested experimentally in the Greenwood Genetic Center (Charles Schwartz) and Josei University (Tokyo, Japan). The collaboration between Clemson University and University of Paris (France) had another outcome. In 2011 Clemson University and University of Paris-Dederot established a dual PhD program. The agreement was signed by President Barker (Clemson University) and President Berger (University of Paris). The dual PhD program requires that each institution provides different training to the student: Clemson University in Physics, with concentration on Computational Biophysics and Bioinformatics; and University of Paris in Life Sciences, with concentration on in silico drug discovery. Each PhD program requires that the student takes courses and complete at minimum one year residential time. Mr. Zhe Zhang will be first student scheduled to graduate on April 18, 2013. Our research is highly relevant to any study involving human DNA differences and their relevance to human diseases. It paves the way toward developing a pipeline for personalized diagnostics, personalized medicine and thus to facilitate human health care. Our goal in a long run is to further improve the methods and approaches used to predict the molecular mechanism of human DNA defects and to find drugs capable of reversing the unwanted disease-causing effects. For such a purpose, we are working to optimize the modeling procedures by benchmarking them against available experimental data of altered biophysical characteristics. This will provide crucial feedback that in silico predicted effects are experimentally measurable. In addition, we would like to go a step further and to apply the same techniques for complex diseases: diseases involving more than one DNA defect. This will require taking into account the interaction networks involving several and more affected proteins and revealing the common outcome of the genetic defects. The work is currently underway carried by PhD students in the lab, Marharyta Petukh and Shannon Stefl. Image Caption: Cover page of PLoS Comp. Biol. (Impact factor 5.22), image credit: Mrs. Marharyta Petukh, PhD student in the Computational Biophysics and Bioinformatics lab, Department of Physics and Astronomy For media inquiries, please contact Brian Mullen at mullen2@clemson.edu or 864-656-2063.